What shade lens for MIG welding? What does the welding lens shade number mean? How to adjust your auto-darkening shade lens? Need a good, reliable helmet for hobby MIG welding? * As a rule of thumb, start with a shade that is too dark to see the weld zone. Then, go to a lighter shade which gives a sufficient view of the weld zone without going below the minimum. According to OSHA’s Fact Sheet, MIG welding (GMAW) or flux-cored welding (FCAW) using currents of 60 to 500 amps requires a minimum lens shade level of a DIN number 10. Both ANSI and AWS are more cautious, recommending a shade number 11 for welding at 60-160 amps, a number 12 for 160-250 amps, and a number 14 for 250-500 amps. Verify that both the welding helmet and lens shade meet ANSI Z87.1 certification. You may not know that most welding helmets with auto-darkening filters (ADF) provide full, or close to full, protection from eye-damaging ultraviolet (UV) and infrared (IR) radiation at all times, even while in the passive light state. Instead of relying on dark state shade settings to block eye-damaging radiation, auto-darkening helmet manufacturers use special lens coatings to filter out the rays. So, if the helmet battery dies, you leave the mask in grind mode (so easy to do! ), or the ADF fails to darken for any reason, the lens still protects your eyes from damaging UV or IR rays. To protect your eyes, look for helmets meeting ANSI Z87.1 standards and review the manufacturer’s technical data sheets for a helmet’s permanent shade protection level. The DIN rating is a German industrial standard used to classify light filtering levels. As the DIN number increases, the lenses become darker and block more light. 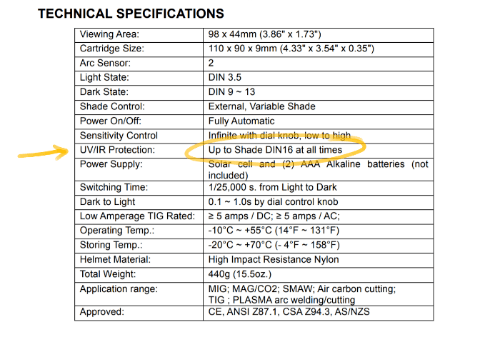 Most auto-darkening lenses have a passive base level of DIN 3 or 4. This light state is bright enough so you can see to set up your work without having to lift your hood. And you can see well enough to operate your grinder—provided your helmet has a grind mode to prevent grinding sparks from triggering the darkened state. A DIN shade 3 level allows around 14% of visible light through the lens, while DIN 4 is three times darker, allowing only 5% light transmission. A significant difference that you should consider if you don’t always work in a brightly-lit area. My helmet has a base shade of DIN 3.5 (10%). As a hobbyist welder most often working in the corner of my garage, I think anything darker would be too dark for my comfortable use. By comparison, blocking the brighter-than-the-sun welding arc, shade 9 allows just 0.037% light transmission and shade 13 only 0.00072% (blocking 99.99928% of light!). If you use an ADF helmet having a permanent shade rating higher than the capacity of your welder—meaning the lens coatings will block all the UV and IR your welder generates—you’re free to choose a setting based on your comfort. An ideal setting is just light enough so you can see what you need to see but dark enough to prevent eye fatigue. If you see spots in your vision after a weld, it’s time to choose a darker shade setting. My personal preference runs closer to the darker shade settings in the ANSI and AWS recommendations. The reason is likely my light-colored eyes. As everyone is different, your actual setting will depend on your working environment and personal preferences for comfort and visibility. Welding helmet lens shade test button. Many better auto-darkening welding shade elements have a self-test button to show you that the ADF in your helmet is working. 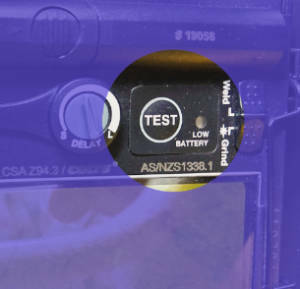 But remember, this test only determines that there is battery power and the ADF can work, it doesn’t prove that it will work when you strike an arc. 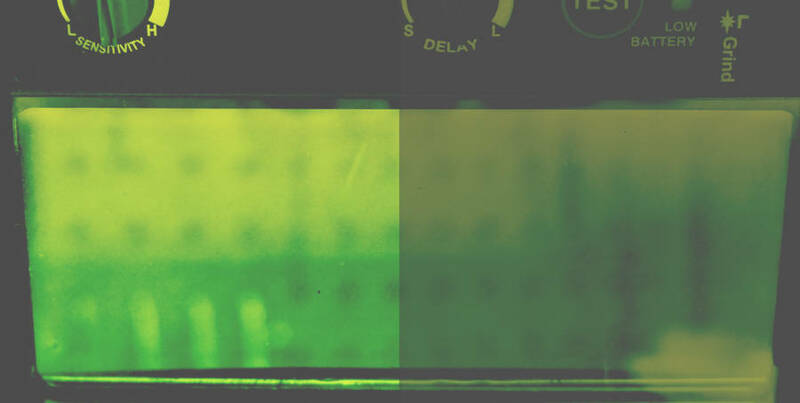 There is another quick and easy method to test your lens operation, including the sensors, for troubleshooting purposes or your piece of mind. The helmet sensors trigger off IR from the welding arc. An ordinary television remote control emits an IR signal that will also trigger the helmet’s sensors. This handy trick can also test how well the sensors pick up signals from side-to-side, or above and below your mask. Good information to know when working around other welders. What are symptoms of "Arc Eye"? sensation of "sand in the eye"
The amount of time required to cause these effects depends on several factors such as the intensity of the radiation, the distance from the welding arc, the angle at which the radiation enters the eye, and type of eye protection that the welder or bystander is using. However, exposure to just a few seconds of intense UV light can cause arc eye. These symptoms may not be felt until several hours after exposure." Northern Tool Model 19056 auto-darkening welding helmet. I still use my first auto-darkening helmet bought from Northern Tool in 2010. Before the Klutch branding of Northern’s welding gear, it’s a Northern Industrial Welding Model 19056. I think it was $60 at the time. I consider this one of the best welding purchases I’ve made. As a MIG welding beginner, upgrading from a no-frills, fixed-shade mask to a much more convenient to use auto-darkening helmet was a real treat for me. I felt safer, more comfortable, and much more able to focus on learning to weld. Northern now calls this helmet the Klutch 700 Series Auto-Darkening Welding Helmet with Grind Mode. It sells for $80 but goes on sale for $60. Solar and AAA battery powered (original batteries lasted seven years). Light-weight (under a pound) and comfortable to wear—easy to forget I’m wearing it. Room to wear safety glasses under the mask for even more protection. Grind mode so sparks won’t darken the shade. I often use my helmet’s grind function. But the switch is located inside the helmet, making it difficult to operate without removing the mask or taking off a glove. If I were to replace this helmet, I’d look for one with an external grind mode switch—like on this helmet—that I could operate wearing gloves without disturbing other nearby settings. Sure, welding as a hobby has some risks. There’s live electricity, red-hot pieces of metal—sometimes flying through the air towards your face—and brighter-than-the-sun arcs. What could possibly go wrong? 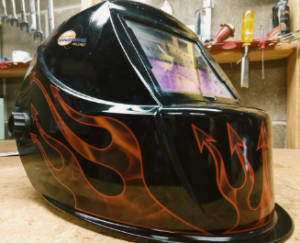 But in truth, we have excellent welding safety features, procedures, and personal protective equipment available to reduce risks so we can safely enjoy our hobby. A must-have for the hobbyist welder, affordable auto-darkening welding helmets provides excellent eye protection and peace of mind. The technology in our helmets lets us safely choose a comfortable darkness level without worry about what shade lens to use for MIG welding.